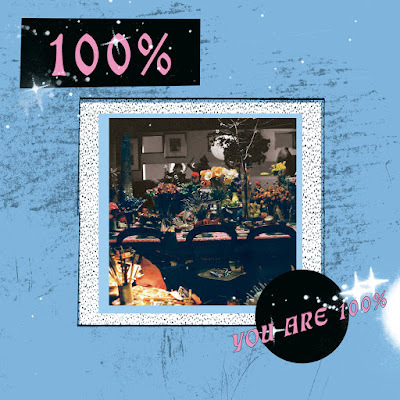 100%'s latest EP is a glowing addition to the cold-wave canon. Whoever coined the genre signifier “cold-wave” obviously had no idea where that musical subculture was headed. From Veronica Vasicka’s Minimal Wave Tapes project to U.S. Girls’ absolutely brilliant Half Free to last year’s show-stopping CC Dust EP, the bizarre international DIY movement of waves in the cold, minimal, dark, and no variety is undoubtedly holding a massive influence in independent music crowds all over the world. But now more than ever, the music that comes from this strange, versatile basement crowd serves to affirm and glow over anything else. That’s just about where 100% fits into the equation. The newest EP from the Australian synth-punkers, a follow up to their equally pleasant self-titled debut, has affirmation written all over it in sparkling, gleaming letters. You Are 100% speaks directly to its audience from the get-go. “You want it / You got it,” croons a sunken, mellow voice over the most summery synths you’ve ever heard on the opener, “The Test.” This is mood music, after all, and 100% play with a perfect mood. They don’t toy with unexpected sounds. Unassuming drum machines and no-nonsense live basslines polka-dot each track, practicing a careful though sometimes aggressive duet with the waves of synthesizer patterns. The styles that appears on 100%’s canvas are historically tied to early techno movements, and on the final track - one that takes its name from the band’s own - the group embraces this the most. Here, repetition is the name of the game. A slow murmur of counting numbers, a simple verse-verse-chorus build, and lo-fi dance construction reminiscent of Crash Course in Science all avalanche together in the EP’s most catchy track. A similar success of artistic and sometimes existential repetition flowers from “Nikita,” a bristling 4 and a half minutes of harsh contrast. Glittering sounds that seem to echo from distant caverns collide with moody punk melodies, creating a warmly melancholic tune. The cold-wave classic “A Night in June” even gets a shoutout in the lyrics, demonstrating the band’s awareness of their roots. At most points, You Are 100% feels like a cold body with a still-beating heart. Vocals are almost sneered while intentionally soulless mechanical sounds make pleasantly corporeal dance beats. The four songs could perfectly background a late-night party as well as conjure detached memories on a long bus ride home. In either case, 100% don’t just recall their genre’s scene. They take it to the powder room, give it a pep-talk, freshen it up, and send it out to dance. Listen to 100% on bandcamp.